The Camp Salute Community is a 76-unit apartment complex being built with a veteran and veteran surviving spouse preference. The one bedroom apartments are 750 sf, the two bedroom apartments are 1100 sf and the three bedroom apartments are 1400 sf. People for People of Gloucester County and the Camp Salute developers, Conifer, LLC are looking for veteran families and couples for the two and three bedroom units. The Camp Salute Affordable Housing Project is a joint venture between The People for People Foundation and Conifer Realty, LLC to provide permanent housing for low to moderate income families with a Veteran Preference. It is the first and only community in the United States built to provide permanent housing to veterans, their families and the surviving spouses of veterans. The Camp Salute apartment complex includes: five (5) apartments dedicated to homeless Veterans, 19 apartments dedicated to disabled veterans and 51 apartments, designated veteran preference. In addition the apartment complex has a community room, exercise room, a computer lab as well as a tot lot playground area and a Veteran’s Memorial area consisting of flags and a sitting area. 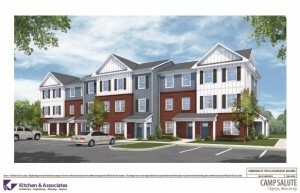 People for People of Gloucester County will be moving their headquarters to the Camp Salute Apartment Complex prior to the official opening of the building in September. They will host partner veteran based support organizations. Together with Federal government accredited claim agents, who will also be onsite, they will deliver workshops that will address several different issues including PTSD, abuse, personal health and hygiene, finances and veteran benefits. They will also manage support groups and coordinate medical transportation services. For a full application package visit: http://bit.ly/Campsalute. Applications will be accepted by mail or in person at the interim Camp Salute leasing office located at Millstream Apartments, 241 Blackwood-Barnsboro Road, Turnersville, NJ 08012. The interim leasing office hours are Monday, Tuesday, Thursday and Friday 9 am – 5 pm. Wednesdays 9 am – 7 pm and Saturdays 9 am -1 pm. All applications must be filled out completely and you must provide a copy of your DD 214. There is a prescreen process that includes a criminal and credit background check and verification of landlord references and there is a required security deposit is due at the time of your interview. The proposed monthly rents for the apartments range from $714 to $870 for the one bedroom apartment, $845 to $1032 per month for the two bedroom apartments and $981 to $1197 for the three bedroom apartments. Residents are responsible for electric and gas. Trash, water/sewer, emergency maintenance, lawn care and snow removal are included in the monthly rent. Pets are permitted with restrictions and must be approved by management. The People for People Foundation of Gloucester County is a grassroots 501 3 (c) organization founded in November of 2003 by community leaders who were concerned about helping their neighbors who fall on hard times. People for People’s mission is to provide financial and advocacy assistance to Gloucester County residents who are normally self-sufficient but have experienced a financial hardship due to loss of employment, sickness, accident, fire, or other unforeseen emergency. In 2003, the People for People Foundation expanded their mission to include the welfare and well-being of veterans throughout the County and State. This was prompted by a dying wish made to Bernadette Blackstock, by her father-in-law, JP Blackstock. JP Blackstock, a WWII veteran, heroically stormed the beaches of Normandy, on D-Day, and was permanently disfigured in later battle. After returning to the states, Blackstock endured years of rehab and received consistent help from volunteers. Indebted to all the people who helped him, Blackstock dedicated the rest of his life after service to volunteering with veterans. This dedication to veterans inspired the Camp Salute community concept and was built in honor of Blackstock’s memory.